The United States flag has had 50 stars since 1960, yet today a flag that bares only 48 stars was returned to its home at Berthoud High School. 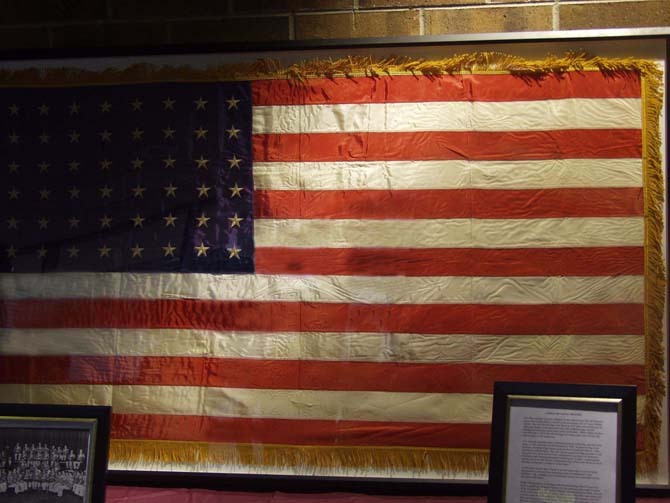 The flag has traveled from New York to California and numerous states in-between, but was first flown in Berthoud. The flag originally flew outside of the old Berthoud Junior-Senior High School, now Turner Middle School. 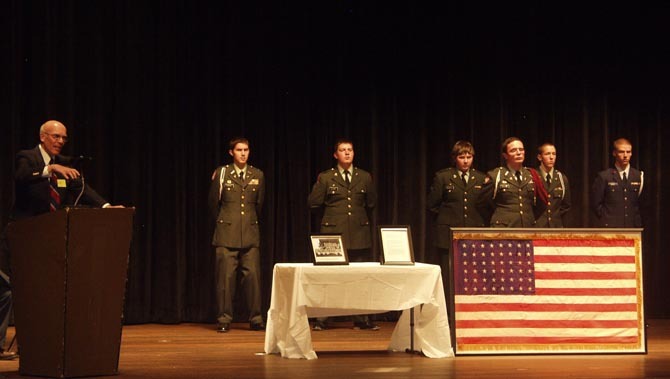 The flag was returned to Berthoud High School in an impressive ceremony on Friday. Members of the Berthoud High School JROTC started the ceremony by carrying the flag into the auditorium. The JROTC officers-in-training who presented the flag were: Cadet Lieutenant Colonel Jonathan Harvell, Cadet Sergeant Major Trenton Pippin-Mandley, Cadet Captain Alex Kerkhoff, Cadet Private Simon Ellarby, Cadet Private Jake McDonald. Alongside these cadets was Cadet Master Sergeant Mythia Siebold representing the Larimer County Civil Air Patrol. Stuart Boyd, former teacher and presently president of the Thompson Education Foundations helped to provide a timeline of the events that tracked the travels of the flag from 1960 to 2011. The flag’s travels started in 1960 with the Berthoud Junior-Senior High School facing the possibility of merging with Loveland’s High School. Beth Bristol, the secretary at the Berthoud school was concerned that the flag might be lost during this transition. To keep the flag safe, she packed it with her personal belongings. As she moved, the flag traveled with her. After 48 years, the flag has returned to its first home in Berthoud. The flag will remain at Berthoud High School next to the painting, When I Touch the Wall, presented to the school by a former Berthoud student who served in the Vietnam War. 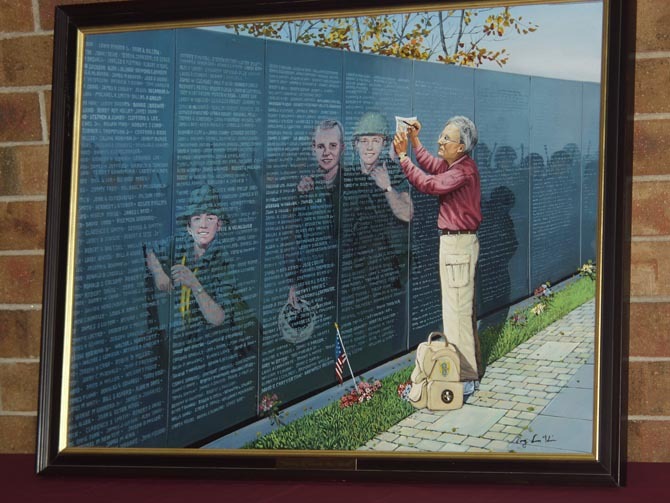 The painting depicts the artist standing in front of the Vietnam Veterans Memorial Wall and the faces of three Berthoud soldiers who were casualties of that war. For the community of Berthoud and surrounding towns, the return of this 48-star flag to its home in Berthoud is a contented return; with deep honor and respect to our nation’s banner. The presentation was a wonderful time to see and hear about a piece of history that will forever be part of Berthoud. Site contents copyright © 2019 Recorder Online	except as noted. All rights reserved. | 96 queries in 2.125 seconds.